Ninja Wars is a game where you take control over a brave blue ninja as he uses a variety of weapons and ninja skills to take on legions of enemy ninjas in this sidescroller beat-em’ up. You can level up your skills, stats, and defeat the evil ninja clan! 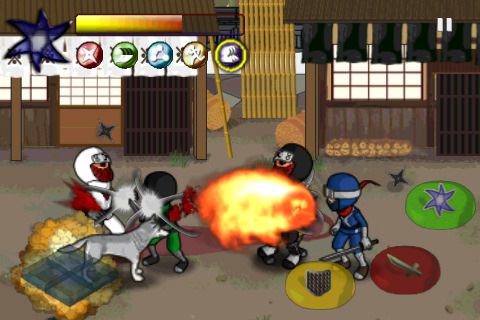 Brought to us by Goldfish, Ninja Wars is available on the iPhone, iPod touch, and iPad for $1.99 with a Lite alternative. There are some nice elements to this game app. First of all, it’s a throwback to all the old side-scroller games of the past. I’m really reminded of the TMNT Turtles in Time or Final Fight when looking at this game. It’s too bad this game controls nothing like the classics, but that’s what happens when you have an iDevice with no buttons. Artistically, Ninja Wars is a mixed bag. The characters look great with a strong art style, though the big heads on enemy units are freakish considering how large they are compared to yours. The levels are detailed yet sloppy, with very clearly paint-brushed lines still left in its original scribbles on the floor, walls, and ceilings. Controls are done with a 4-way button scheme like a standard d-pad, but it’s not too responsive compared to joystick style controls and it shows when you are in a panic to move out of way of attacks. You have 3 action buttons; a defend button to counter attacks (holding it does nothing), an attack button, and a change special move button that toggles through your 5 available special attacks. There is a leveling system in the game, but it’s completely unexplained in game. There are symbols like swords, 3 wave things, a ninja star, some kind of triangle/ball thing, MSN messenger, and a crosswalk man. No explanation what those do so when you want to level up, it’s pretty much a guessing game. The AppStore description actually tells you what you are updating, but the problem is, this is an iPhone app. I shouldn’t have to exit the app to know what the basic leveling stats are. Hit detection is sketchy, but when you got your opponent’s in a chain of attacks, you can actually kill entire rows of them at the same time if you line them up right. Bosses are more difficult because they can attack through your chain of attack. The gameplay gets really repetitive after a while when the same enemies appear to get slaughtered, each with the exact same strategy of walk towards you close range and attack. Each level is short and the same pretty much until you reach a boss, but they are entertaining when you learn what your special attacks are. After you kill all the enemies though, there is a strange moment where you have to move to the right side of the screen to move on… why? Your movement speed is slow, there are no obstacles in your way, and there is no time pressure to do this, so why do I have to walk to the edge of the screen just to get the level-up screen? Just end the level after I kill the last enemy. Overall, the character and enemy designs in Ninja Wars are good, the combat can be fun sometimes, and the ninja skills are pretty useful. Controls, user interface, and oddly short levels take away from a potentially great game. They’ve fixed a slew of bugs in the past, but they really need to spend more time refining. Nice attempt. Support these guys by trying Ninja Wars Lite out for yourself. If you like it, buy it. 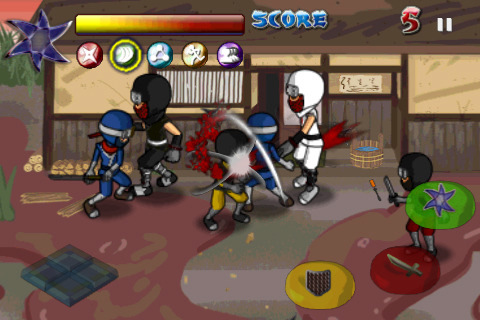 AppSafari review of Ninja Wars was written by Joseph Ho on September 2nd, 2010 and categorized under Action, App Store, Beat-em Up, Games. Page viewed 5263 times, 2 so far today. Need help on using these apps? Please read the Help Page.